This simple and powerful protection spell was taught to me by Hekate six years ago, when I still identified as Wiccan. It should be recast every two to three years. She has asked me to share it with you all, so that whomever is in need may have a means to protect themselves. This spell should be cast during the Dark Moon, but if the need is great, don’t wait. On a personal note, I followed the *Lycian Wiccan Rede in regards to magic, which can be found here. The spell utilizes the cord chant, as taught in Ray Buckland’s big blue book, the only change being that the word “knot” is replaced by the word “count”. It also utilizes Hekate’s chant, which came into my mind while praying to her, as I envisioned this spell. This is a powerful spell, and can be used as a barrier against the general negativity that is often just floating around, undirected. However, I had conceived this spell originally as a specific response to someone whom I knew was engaging in direct spiritual warfare against my family. 1.) A dark vessel, cauldron or container to represent the cosmic womb. 2.) Nine small, round mirrors; or if you prefer, large silver sequins. Either can be found in craft stores, like Hobby Lobby. 3.) An incense that Hekate and yourself find pleasing. 4.) One black, or white candle. I’ve used both to great effect. 5.) An offering for Hekate to be given immediately after the working, as well as a promise of another offering upon the spell’s success. Earth, Air, Fire, Water, Spirit, Dark and Light. Gather now inside the womb, for all their spite shall be their tomb. Each mirror now absorbs the Power shaped and bent this holy hour. As they send ill will this way, nine times shall they be repaid. 1.) Open sacred space, then welcome the elements in whatever way is best for you. 2.) Dress the candle, then light the incense as you request Hekate’s presence, in whatever way you feel is appropriate. Explain your situation to her, then ask her permission to cast the spell. If her answer is favorable, continue. If not, cease immediately. Do this in whatever way you feel comfortable, but make sure you do it. Don’t forget. 3.) Light the candle. Place the mirrors, or sequins inside the vessel, and begin. By count of one, the spell’s begun. By count of two, it cometh true. By count of three, so mote it be. By count of four, this power I store. By count of five, the spell’s alive. By count of seven, events I’ll leaven. By count of eight, it will be fate. By count of nine, what’s done is mine. 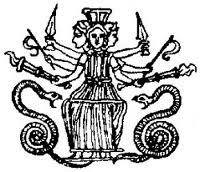 When it is finished you should have spoken Hekate’s chant a total of forty-five times, sealing it in specific increments, with Ray Buckland’s modified cord chant. Prayer beads can help, but with a focused mind, you should have no problem keeping count. 4.) Thank Hekate and tell her that you will give her the prepared offering very soon. Release your circle (if you cast one), and place the likely still-burning candle and/or incense in a safe place to burn out, entirely. Place the vessel, with the mirrors or sequins still inside, near the candle as it continues to burn. 5.) Go outside (after the candle burns out, if no one else will be around to watch it) and leave the prepared offering at a three-way crossroads, if possible. However, any green and growing patch of land will do. Thank Hekate again, then walk away without looking back. 6.) The next day, take the mirrors (or sequins) out of the vessel, to be hung outside, over the entrances and/or windows of your home. Use all of the mirrors (or sequins), even if you have to hang one from the rear-view mirror of your car. It’ll be up to you to figure out how to hang them properly. 7.) Wait for your situation to improve, which shouldn’t take long. Really, it should be within a matter of days, if not weeks. In any case, you should notice improvement soon. 8.) Upon success of the spell, give Hekate her second promised offering, in the same manner and place that you gave her the first. Again, thank her and walk away without looking back. 9.) Enjoy Hekate’s Barrier against negativity and harmful magic! 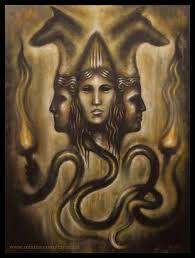 Hail Hekate, and Blessed Be! *Note: I am not, nor have I ever been affiliated with the Lycian Wicca Tradition. I had simply adopted their version of the Rede, because it made the most sense to me, and because I believed it to be the most realistic version in existence. As I am no longer Wiccan, the Rede itself no longer applies to me, regardless of which version it may be. This entry was posted in Spells and tagged chant, Dark Moon, Hekate, magic, magick, protection spell, spiritual warfare. Bookmark the permalink.